No need to choose between comfort and stability! VB-Airsuspension has added the 'VB suspension upgrade kit for motorhomes' to its product range. This upgrade kit means you no longer need to choose between comfort and stability. The VB suspension upgrade kit is made up of two complete suspension struts with shock absorbers that apply FSD technology, special coil spring suspension (VB-CoilSpring) and two rear shock absorbers with FSD technology. The problems above can be resolved using the VB suspension upgrade kit for motorhomes. The upgrade kit includes shock absorbers that apply FSD technology. FSD stands for 'frequency selective damping'. With standard shock absorbers you usually have to make a choice between stability and comfort. However, the addition of a special valve allows the shock absorber with FSD technology to vary its own damping force. This immediately results in better vehicle behaviour in terms of comfort and stability. VB-Airsuspension has many years of experience with shock absorbers that apply 'FSD technology' and, throughout this time, has sold thousands of reinforced front springs. 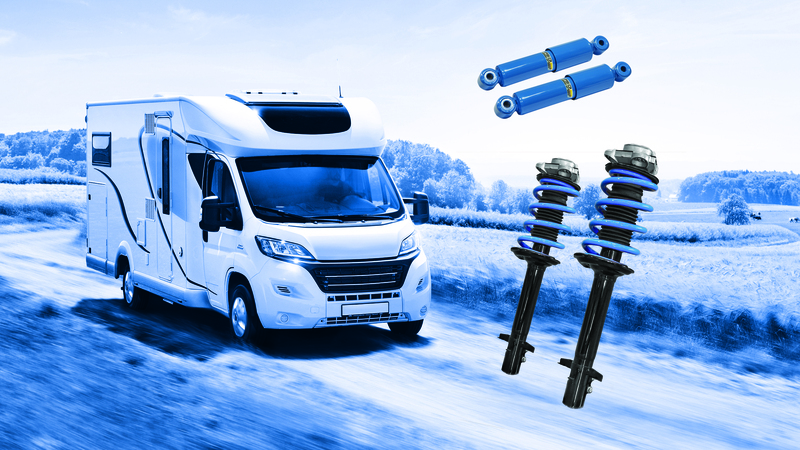 A combination of top-performing reinforced front springs from VB-Airsuspension and shock absorbers that apply FSD technology make up the 'VB suspension upgrade kit for motorhomes'. This 'upgrade kit' provides the best in comfort and stability in this class. The 'upgrade kit' is available as a kit for the front and rear axles, but is also available for individual axles. Citroën Jumper, Fiat Ducato and Peugeot Boxer with X250/X290 chassis (2006 to date), original chassis and AL-KO chassis. Mercedes-Benz Sprinter and Volkswagen Crafter (2006-2016).